«Dès la première seconde, uns scalpel. Une heure plus loin, une vision de la planète. Sept tableaux qui son tout sauf contemplatifs. Mouvant, implosant, bruissant, virulent, l'univers du contrebassiste anglais n'a jamais paru aussi littéralement sidérant. D'une extrême tension, la musique de son tentette euro-américain dit les soubresauts du monde et ses îlots de tendresse désespérées. Le FREE da la passion. Der Bassist, Bandleader und Komponist Barry Guy hat mit seinem New Orchestra eine Plattform geschaffen, die höchst individuelle Klangsprachen in wechselnden Kontexten miteinander vernetzt. Die Ausdrucksgeste des frühen Free Jazz ist in dieser Musik ebenso aufgehoben wie das Strukturbewusstsein einer post-webernschen Neuen Musik. Was entsteht, weist über die genannten Traditionen hinaus auf eine hochkomplexe, dabei durchaus sinnliche Synthese aus Komposition und Improvisation, die den Exzess des Geräuschhaften ebenso zulässt wie den kontemplativen Klang. Sie ist wild, frei, ungestüm und eigensinnig, die Musik, die der englische Komponist und Bassist Barry Guy für sein zehnköpfiges New Orchestra geschrieben hat. Die rund siebenteilige Suite "Inscape - Tableaux", gespielt von einigen der herausragendsten Köpfen der amerikanischen und europäischen Free-Szene, verbindet das Beste vom europäischen Freejazz, die gewaltige Ausbruchsenergie und die ekstatische Expressivität der freien Kollektivimprovisation, mit den spannendsten Errungenschaften der Neuen Musik, dem Weg zu einer "strukturierten Freiheit" mittels grafischer Notation, zu einem Pastiche unterschiedlichster musikalischer Materialien und zu einer neuen Dialektik von Inhalt und Form. Was kann man von Musik mehr erwarten? When the Barry Guy New Orchestra reassembled in Vancouver last June for just its fourth concert, its first in over a year, the improvised music set couldn't believe their luck. It was, by any standard measure, a coup. Considering the ten-piece group's lineup, an exceptional gathering of European and American improvisers, and the sheer size of its signature piece, Guy's seven-part composition, "Inscape - Tableaux," finding a festival for its first (and only) North American appearance wasn't easy. "We've got so many amazing players in this band we can present almost anything," Guy told me in the middle of the group's four-day whirlwind through town. "It's very hard to persuade a festival organizer to utilize the potential of the group. To say, 'Well, look: Other than the big band we actually have the [Evan] Parker Trio, we have the Guy/[Mats] Gustafsson trio. Or you can have the Marilyn Crispell Trio. And more.'" But the Vancouver International Jazz Festival didn't need much convincing. Breaking off into a variety of duos, trios, and quartets, the orchestra blanketed the festival's first few days. In some respects, the BGNO (as Guy is given to calling it) simply recreated its first performances in Dublin last year. To debut the new group Guy set-up four days of music, plotting out a compelling network of groupings and daily rehearsals, culminating in the premiere of "Inscape-Tableaux." For some of the players it was the first time they'd ever met. It was a masterstroke -- and, for Barry Guy, something not unfamiliar. For nearly thirty years with the London Jazz Composers Orchestra (LJCO) he's tackled the often problematic relationship between composition and improvisation, a lifetime trying to make improvised music work in large group settings. "Guy's LJCO recordings," Bill Shoemaker recently suggested, "comprise a Teflon-like argument for the legitimacy of the composer in improvised music, as his works are casebook studies in the integration of improvisation and predetermined materials and the empowerment of improvisers to substantively shape the work." Indeed, the BGNO fits snugly into this tradition. Built on the questions (and problems) posed in the LJCO, Barry Guy's New Orchestra was born out of its predecessor's unwieldy economics. After the LJCO's last concert at the 1998 Berlin Jazz Festival (with Marilyn Crispell and Maggie Nicols as guests) -- "a remarkable evening," Guy recalls, "because the band was on absolutely top form" -- the prospects looked bleak. "The months passed after Berlin, we tried to get some more work, and basically the information coming back to us was that nobody has any money for big bands, unless you have government support. Patrik Landolt from Intakt wanted to do another album and he said, 'Look, why don't you think of a smaller band.' Which to me was the unthinkable because in a way that's my baby, the LJCO, with the size of it -- the orchestration, the understanding how I could write for it. A ten-piece band seemed a proposition that was untenable. However, it was suggested as a financially easier option." Landolt persisted. "He said, 'Why don't you just give a thought to who you'd want in the band.' That was the difficult thing because I had all the guys that were in the LJCO who I'd worked with for years. But I decided to just let that be, to push that to one side and find the reasons for putting a ten-piece band together -- and who to get into it. It seemed to me that the best way of doing this was to almost get back to the first principles that I had with the LJCO: to gather around under this umbrella a group of players that I had recently been working with in small groups, in duos, trios. And also players that had played with each other in various groupings over the years. "So the Parker Trio was the obvious starting point because I love working with Evan and I love working with Paul [Lytton]. And of course then there was the Swedish trio with Mats Gustafsson and [drummer] Raymond Strid. So there were two, for me, very interesting trios: one younger one, and the other established but dealing with trio music in a completely different way. I thought that would be quite an interesting focus, and axis point. And then I had been working with Marilyn in trio formations, either with Gerry Hemingway or Paul Lytton, so it would seem to be a necessity to get Marilyn in. And I was wanting to write some things for Marilyn anyway -- some ballads, slower things -- since she was interested in that area. And she had also made records with the Parker Trio and the Gustafsson Trio. "And tuba: Per Eke Holmlander, a Swedish player that played in Mats's big band. He was such a good player, very powerful, good improviser, really nice guy, knew the Swedes well, of course. So that was the Viking Trio, in a way (with Raymond Strid on drums), a very special dimension. Having, as Guy characterized it, "accepted the ultimatum that this was going to be a reality," he began to write -- or to at least think about writing. "For quite a while I didn't necessarily do anything on the piece," he recalls. "But there were moments, when I was walking somewhere or sitting at the drawing board working on something else, I would suddenly visualize the BGNO and how it could come together, just sound-wise, as an ensemble. There was a period of gestation: I was having to adjust to the possibilities, the sonic expectations, compared with the LJCO. But there came a point where new things started to stir, reducing the larger orchestra down to a compact aural scenario in my head, but at the same time I was realizing that because they're singular instruments a new sonority started emerging in a very subtle and nonspecific way. An idea was forming itself in my head about clarity and sharply defined gestures. For instance, 'OK, there is one trombone. But that one trombone is powerful and it can actually have a very important and decisive effect within an ensemble,' whereas the three trombones in the LJCO were used in a strategically different way. "It was a slow and not very scientific way of forming the sounds of the band. But as these things were happening I found myself more and more making marks on paper, like an artist with a paintbrush. Even before this all started coming into place I'd just get excited by the imagination of a particular instrumental grouping, or one player playing against a construct. And I would just make a mark, or a series of marks, not actually writing notes even. Just a very soft pencil, just digging the paper in a way. It's almost like cavemen making marks on rocks, just images to remind you exactly what you want to do. But in the context of the other things that might have been accumulating, they made sense: something to do with a density of sound, or tailing off to a lightness. I would even change pencil thicknesses sometimes to give a sense of density change." "In the early part of 'Inscape - Tableaux' I wanted the exposition to present the two powerhouse trios of Parker and Gustafsson. Before that, however, I wished to present the brass players in short vignettes that would gradually accumulate in energy to the point where they would come together and comment on the progress of the trios as they made their way to a sonically elevated level. "The other thing that I did at this initial stage was put all the names on a list and connect up who, to my knowledge, had played with whom. There were the obvious trios and parings that had featured in my musical life. But what about Johannes Bauer, for instance. There evolved this very complex, spaghetti-like diagram. And then I started looking at the diagram to realize who hadn't played with somebody in a particular situation. So not only were there the familiar groups, but also the unfamiliar, as well -- which became a useful tool to evaluate structural procedures. "What I try to do is also think of the possibilities of it going wrong as well as right -- if it deviated into an area which wouldn't be appropriate. But then you have the trust of the players. I always have the complete trust in the improvisers: they instinctively know where in the creative process it should go. There's a kind of mystery in this, as well, about how these things might work. But I try to assess the probabilities of where they might go. And it can come up with massive surprises, but on the other hand, its creativity is assured." "Inscape-Tableaux" may be a monument to Barry Guy's ingenuity and these improvisers' singular skills, but it will be a balancing act to keep the BGNO a viable affair. While a number of national arts councils have generously supported the band, it's been difficult just getting everyone in the same place. "In reality, of course, it's been the biggest nightmare ever," Guy explains referring to the logistics. "The old days of meeting the London Jazz Composers Orchestra at Heathrow Terminal 2 was not to happen anymore." Still, the BGNO regrouped in Nickelsdorf, Austria this August, followed by a three-city Scandinavian tour in the fall. This spring it seems the group will be in Paris and in Mulhouse in the summer. With the LJCO on hold, Guy is committed to making the New Orchestra an ongoing project. Not only is he hoping to produce more music, but Mats Gustafsson has plans to write for the group, as well. And after this second spell of gigs, one might expect "Inscape-Tableaux" to still find its place in the band's book. "Could be," Guy responds. "Since the piece is actually taking on a good feel, people are relaxing into the music now.... The thing that I definitely want to present to an audience is something which is organic and growing in front of you. I want the process to be joyous and energizing -- to breathe." Copyright Greg Buium . 2002 . Used with his permission . This article first appeared in Coda , # 302 , March - April , 2002 . Der Brite Barry Guy ist nicht nur ein herausragender Komponisten zwischen Freier Improvisation und Neuer Musik. DLF über einen, der ganz «nebenbeiÕ auch noch meisterhaft Bass spielt. Die Frage taucht selbst im Kreise versierter Jazzfans immer wieder auf: Ist das Komponieren von Werken für Freie Improvisation nicht ein Widerspruch in sich? Keineswegs, entfalten doch gerade Musiker dieser Szene in der Regel meterlanges Notenpapier, ehe sie loslegen. Doch wer sich solche Blätter aus der Nähe ansieht, wird daraus selten schlau. Freie Improvisation funktioniert weniger mit konventioneller Notation und linearen Abläufen als mit Mustern und komplex konstruierten Strukturen. Barry Guy ist ein Meister solcher Strukturbauten. Die Werke des 54jährigen Ex-Architekten aus London zeichnen sich aber nicht nur durch ihre Komplexität aus, sondern insbesondere durch die Vielfalt der «BaumaterialienÕ. Ausgegangen vom europäischen Freejazz der wilden 60ties, hat sich Guy stetig der Neuen Musik angenähert. Mehr noch: Guy liebt Barock- und Renaissance-Weisen und integriert selbst solch streng geregelte Klangelemente in sein Schaffen. Die Kombination aus ungestümer Free-Mentalität und der ins Mathematische tendierenden Präzision Neuer Musik macht das Schaffen von Barry Guy einzigartig. Welch glückliche Fügung, dass er ein Workaholic ist, der sämtliche Aspekte seiner musikalischen Weltsicht auszuloten scheint. Guy konzipiert und schreibt und spielt was das Zeug hält - ohne qualitative Reibungsverluste wohlgemerkt. Sein Album «Inscape-TableauxÕ ist nicht nur von Bert Noglik (WoZ) und Christian Rentsch (Tagesanzeiger), sondern auch vom renommierten französischen Magazin «JazzmanÕ zum Jazzalbum des Jahres 2001 gekürt worden. Eine Sensation angesichts der marginalen Stellung Freier Improvisation im weitläufigen Jazzkosmos. Für «Inscape-TableauxÕ hat Guy zehn der spannendsten Köpfe aus den USA und Europa zu seinem New Orchestra zusammengesucht; darunter auch den Bieler Saxophonisten und Klarinettisten Hans Koch. Zur Schweiz hat er naturgemäss eine enge Beziehung, lässt sich die hiesige Impro-Szene doch hören (siehe nebenstehenden Bericht). Er spielt regelmässig mit Schweizer Musikschaffenden, ist Stammgast bei der «FabrikjazzÕ-Reihe in der Roten Fabrik und gibt einen guten Teil seiner Alben beim Zürcher Label «IntaktÕ heraus. Und dies mit unterschiedlichsten Formationen. Barry Guy - obendrein ein meisterhafter Bassist - ertastet mit Duos und vor allem Trios, was er mit Grossformationen zur voluminösen Perfektion bringt. Mit seinem 1970 gegründeten London Jazz Composers Orchestra hat er das «KlanggefässÕ Big Band schlicht neu definiert. Er schreibt aber auch für klassische Orchester wie die City of London Sinfonia oder die London Sinfonietta, sowie Kammermusik für Kronos Quartet oder Hilliard Ensemble. Unter dem Titel «Die Verwandlung der SchwerkraftÕ unterhält sich DLF-Redaktor Michael Engelbrecht mit Barry Guy über Komposition, Improvisation und Fusion. The momentous music marks the auspicious recorded debut of Barry Guy's newly retooled and streamlined large ensemble, concisely christened the New Orchestra. His well-established London Jazz Composers Orchestra held a reigning position as the preeminent grand-scale improvising ensemble in Europe and abroad for years. This new assemblage builds upon the strengths of its predecessor while striking out in bold new directions. Rather than a distillation of the earlier colossus, it's more of a reimagining. Expanding the pool of suspects from a predominately British cohort to one drawing from a broadly multinational base, Guy's outfit remains redoutable in its ability to flatten the skeptics. As in previous meetings of the LJCO, the new piece balances complex composition and free improvisation with an Ellington-like emphasis on individual voicings. the rallied players are among the most formidable and unique in the global improvisatory community and Guy's score maximises their choices for individual and collective invention. The musicians in turn seize upon the structured freedom, rallying through an inventory of inspired combinations.Crispell's piano is a guiding beacon throughout much of the melee, manoeuvring the group and joining together the piece's myriad sections. The shifts between lyrical and the tempestuous are so sudden and numerous as to become dizzying. Sections of relative reverie intersperse moments of collective and concerted high impact blowing, bowing, pounding and bashing. In the first segment alone Bauer, Parker, and Gustafsson self immolate in instrument splintering solos above a percussive conflagration. Crispell's piano and Parker's circular blown soprano burst forth from the ensemble trailed by the unctuous brass of Robertson. Bauer and Holmlander only to resurface again together in the early minutes of 'Part II.' Later Guy and Crispell meet in a sombre contemplative duet commented on by growling, suspirating horns. It's a pairing they return to and explore more fully in the opening minutes of 'PartIV' only to be joined again by the horns and percussion, this time in meditative confluence. The disc is filled with these sorts of diadic interactions, initial forays that are eventually amplified through renewed associations in subsequent sections of the piece. 'Part V' quickly redeposits the group in dissonant surroundings, eventually parting for soaring turns from Bauer and eventually Robertson. Crispell's categorical clusters part a path for first Holmlander on deeply resonating tuba, and then Koch on register bucking bass clarinet during the initial segments of 'Part VI.' The concluding 'Part VII' offers a final descent into the maelstrom with individual solos giving sway to volley after volley ensemble energy - a fitting end to hear the group converge a full muster. Guy has effectively reshaped his most renowned composing vehicle into a new entity every bit as arresting as its predecessor. Engineer Peter Pfister deserves special commendation for capturing the massive sonic complexity of the band with such pristine clarity. Each instrument is clearly and concisely discernible even during the most opaque and violent moments of full ensemble release. Für frei improvisierende Musiker ist es äusserst diffizil, einen adäquaten und stimulierenden Kontext zu kreieren, der es ihnen erlaubt, in einer strukturierten und dennoch uneingeschränkten Art spontan zu «komponieren». Dem britischen Kontrabassisten Barry Guy gelingt dieser Spagat immer besser. Bereits für sein legendäres London Jazz Composers Orchestra hat Guy, der sich ausschliesslich für Barockmusik und Free Jazz interessiert, ausgeklügelte Suiten geschaffen. Das jüngste Werk, Inscape-Tableau, das er für sein «New Orchestra» kreiert hat, ist seine bislang stärkste Komposition. Die auch optisch wunderbar gestaltete Partitur enthält sowohl grafisch notierte wie auch konventionell geschriebene Teile. Im hochkarätig besetzten Tentett finden sich zwei auch autonom konzertierende Trios sowie - als Hauptsolistin - die grossartige Pianistin Marylin Crispell. Diese Subformationen werden verzahnt, mal separat, mal im Kollektiv behandelt. Die ausladende, überraschungsreiche Komposition umfasst - wie bei Guy üblich - hymnische, beinahe pathetische Episoden, Jazzklänge (die oft an den Big Band Sound Duke Ellingtons erinnern) und unzählige stimulierende, ja elektrisierende Muster, die - wie früher die Big Band Riffs - den frei improvisierenden Solisten den Weg deuten. Ein zukunftsweisendes Meisterwerk! After 28 years leading the mostly British, usually 18-piece, London Jazz Composers Orchestra (LCJO), the now Ireland-based has organized an all-star tentet to perform this multi-faceted composition which took two years to perfect. As multinational as the EU, the Barry Guy New Orchestra (BGNO) features only two other Englishmen, as well three Swedes, two Americans, a German and a Swiss national. Most have worked with the bassist before -- some extensively like Evan Parker and Paul Lytton. All are at the top of their form. It would be stupid to say that the colors brought forward by the LJCO's additional eight to 10 players can be equaled by BGNO's fewer musicians. But together these improvisers are so proficient on so many instruments and so cognizant of so many techniques that what they produce easily has the resonance of a larger band. Though scored, Guy's "Inscape - Tableaux" leaves plenty of space to take advantage of each individual's talents. Especially noteworthy is pianist Marilyn Crispell, who as well as being integrated into the ensemble, is featured in three keyboard-centered interludes between the larger orchestral sections. Sometimes pastoral, as in the beginning of "IV"-- practically a duet for her and Guy's flying fingers -- sometimes powerful, Crispell seems to bring her classical chops to the fore here. Distinctively unique, her playing no more resembles that of Cecil Taylor --as some lazy commentators have suggested -- than Jesse Helms' politics resemble those of Jesse Jackson's. Trombonist Johannes Bauer's showcase comes on "V," an exploding comet of cacophony, which harkens back to the earliest days large ensemble free jazz. Here and elsewhere his vocalized, guttural cries simultaneously suggest New Orleans tailgate and outer space. "V" also features some of Herb Robertson's best Maynard-Ferguson-meets-Cootie-Williams explosions. With only three valves, the American trumpeter is able to produce the sort of multiphonics saxophonists need many keys to generate. Still, this Ellington band-like aggregation of stylists shouldn't obscure that the BGNO is very much a composer's vehicle, with echoes of European New music and on "II" Charles Mingus' scores for mid-sized ensembles. Listen again to an interlude in "V" and observe the perfect clarity of Per �ke Holmlander's tuba making its way like a hippo across the Veldt as the untamed wild birds that are the horns vocally leap and frolic overhead. Like Ellington and Mingus, Guy writes with the idiosyncrasies of his players firmly in mind and the score sounds that much the better for it. One could go on and on appending extended examples of sophisticated and eventful writing and outstanding solos, but how many more superlatives can be heaped on this groundbreaking disc of modern music? Suffice it to say that Inscape - Tableaux deserves to be heard by anyone at all interested in modern composition and the state of 21st century orchestral sound. We can also hope, that sometime in the future, this Valhalla of improvising giants will tour in this formation. Bisher meinte ich noch in jeder Einspielung von Barry Guys Jazz Composers Orchestra ein Haar in der Suppe zu finden. Das BARRY GUY NEW ORCHESTRA macht mir dagegen bisher ungetrübten Spass. Was für eine Besetzung aber auch. 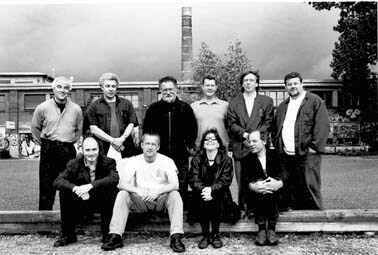 Auf der 7-teiligen Suite Inscape - Tableaux (Intakt 066) spielen Marilyn Crispell (piano), Evan Parker und Mats Gustafsson (sax), Hans Koch (clarinet, sax), Johannes Bauer (trombone), Herb Robertson (trumpet), Per �ke Holmlander (tuba) und die beiden Perkussionisten Paul Lytton und Raymond Strid neben dem Komponisten selbst am Kontrabass. Vereint im Bewusstsein, dass "music is sound... truth-bearing sound... beautiful sound that relocates the locus of beauty". Guys Comprovisation entwickelt unmittelbar eine mitreissende Verve, Passagen wilder Dramatik wechseln mit nahezu mystischem Tasten nach dem richtigen nächsten Ton. Der unverwechselbare Klang jeder einzelnen Stimme ist ein Element der Komposition. Individuelle Expressivität und Introspektion werden fugenlos integriert in eine musikalische Gussform, in der Guy seine ganze Erfahrung mit und seine Vision von Aussenskelett und Substanz eines Orchesterklangkörpers einfliessen lässt. Wie in allem Perfekten, schwingt Perfektes mit: Die so ganz englischen Brassinnovationen eines Michael Gibbs, John Surman, Keith Tippett, Mike Westbrook... - der elegische Part IV klingt aber nicht nur wie eine Reminiszenz an dessen Blake-Hommagen, er scheint den Geist des Proto-Blueser John Dowland zu beschwören und im folgenden Posaunensolo klingen die herzzerreissendsten Lamentos der Musikgeschichte mit an. There are so many levels on which this magnificent set of performances led and orchestrated by bassist Barry Guy can be appreciated. What he calls his New Orchestra is essentially a pared down version of his larger London Composers Jazz Orchestra, but this smaller group is no less potent or any less convincing. For one thing, there is GuyÕs brilliant writing, which permits the players Ð and these include some of the cream of the European jazz avant-garde Ð to flourish through individual solo contributions wrapped around kernels and flashes of magical insights. Saxophonists Mats Gustafsson and Evan Parker exemplify the high level of improvisation, but there is a wealth of talent everywhere, including pianist Marilyn Crispell, trumpeter Herb Robertson, and trombonist Johannes Bauer. At heart, Guy is a landscape artist who paints broadly and passionately, but who pays careful attention to details. His own voice on bass is heard here more than with his larger conglomerations Ð an additional treat. In the end, it is the broad strokes, the vision, the grandeur that most impress. A magnificent achievement. Der englische Bassist und Komponist Barry Guy hat 28 Jahre lang das London Jazz Composers Orchestra geleitet und sich auch in kleineren Formationen als ein wichtiger Proponent des europäischen Free Jazz etabliert. Ein wesentlihces Element in seinem Schaffen war und ist der Grenzgang zwischen Avantgarde, E-Musik und Jazz; so hat Guy auch schon Partituren für die Academy of St. Martin-in-the-Fields, das Kronos Quartet oder das Hilliard Ensemble geschrieben. Die vorliegende CD ist die erste des Barry Guy New Orchestra, eine quasi kondensierte, 10köpfige Ausgabe des LJCO, in dessen Besetzung sich drei von Barry Guys ständigen Trios vereinigt finden: das Evan Parker-Barry Guy-Paul Lytton-Trio, das Marilyn Crispell-Barry Guy-Paul Lytton Trio sowie eines mit den schwedischen Musikern Mats Gustafsson und Maymond Strid. Für sein New Orchestra, das noch um je einen Musiker aus den USA, Deutschland, Schweden und der Schweiz ergänzt wurde, hat Guy eine siebenteilige Suite geschrieben, in der sich teils sehr aufwühlende oder oszillierende Tutti mit Solo-Features für die New Yorker Pianistin Marilyn Crispell aubwechseln. Das überaus disziplinierte und hdanverlsesen Ensemble besticht durch Präsenz und variantenreichen Klang, lässt den Hörer ob der Intensität der Darbietung auch ein wenig sprachlos zurück.
) Le présent album offre un casting ahurissant et une musique dont l'agilité nerveuse prouve que le tentet du New Orchestra n'est pas un LJCO de poche: il regroupe deux trios ave lesquels Barry Guy (b) travaille - Evan Parker(ss, ts) et Paul Lytton (perc); Mats Gustafsson (saxes) et Raymond Strid (perc) - et qui ont enregistré avec Marylin Crispell (p). On n'en finirait pas d énumérer les liens qui existent entre tous les musiciens convoqués ici: Hans Koch (cl, saxes), Johannes Bauer (tb), Herb Robertson (tp) et Per Ake Holmlander (tuba); on notera malgré tout que le Nu Ensemblen de Gustafsson, à l'effectif comparable, comprenait entre autres Guy, Holmlander et Strid et certaines ressemblances stylistiques rapprochent les deux teams. Séquences frémissantes, d'un minimalisme pointilliste, tutti au lyrisme presque sucré bientôt cinglés par les draches de Crispell (particulièrement exposée dans trois des sept mouvements de cette suite) et les écorces jetées de Parker ou Gustafsson. Une oeuvre pleine de sève, haletante, foisonnante et passionnante. Barry Guy : une musique qui déambule ? Récemment invité par le Centre culturel Einstein à Munich, le contrebassiste, improvisateur et compositeur Barry Guy présentait de nouvelles compositions. A Jazz Magazine, il fait le point sur ses activités. Né à Londres et aujourd'hui installé en Irlande, Barry Guy est l'un des contrebassistes et compositeurs les plus innovants de la musique d'aujourd'hui. Partageant très tôt ses activités musicales entre la musique baroque (tout particulièrement au sein du London Sinfonia pendant près de vingt ans) et la musique librement improvisée (membre dès 1966 du Spontaneous Music Ensemble de John Stevens), Barry Guy a écrit -- à l'instar d'un Duke Ellington -- une grande partie de ses compositions pour le London Jazz Composers Orchestra (LJCO), un grand orchestre créé au début des années 70 qui connut au fil des années des avatars, des motivations et des personnels différents. D'autres compositions de Barry Guy, pour des ensembles de musique de chambre et pour d'autres big bands, témoignent de son étonnante versatilité. En tant que soliste, il se produit en compagnie de jazzmen et/ou d'improvisateurs de premier ordre, tels qu'Evan Parker, Bill Dixon, Irène Schweizer, Barre Phillips, Marilyn Crispell ou Mats Gustafsson. Initiateur du festival "Come Sunday" qui se tient régulièrement à Munich depuis trois ans (en collaboration avec le Forum International de Compositeurs & d'Improvisateurs), l'office culturel de la ville de Munich (sous l'instigation de Christoph Hoefig) est aussi à l'origine de résidences de compositeurs-improvisateurs invités à venir travailler avec l'Ensemble ICI : Vinko Globokar (1998), Barry Guy (1999) et Giancarlo Schiaffini (2000). Après une première année de résidence en 1999, la ville de Munich commandait à Barry Guy deux nouvelles compositions pour l'Ensemble ICI (présentées en première mondiale) : Gaia et Switch, ainsi que la reprise d'une composition ancienne, After the Rain. C'est la configuration architecturale particulière du Centre culturel Einstein -- une immense bâtisse située en plein cÏur de la capitale bavaroise, divisée en multiples salles, couloirs et recoins -- qui a donné à Guy l'idée de Gaia, composition conceptuelle déambulatoire. Issus de l'Ensemble ICI (au sein duquel on remarque le saxophoniste Martin Fredebeul, ancien compagnon de Philippe Deschepper et Jacques Mahieux en France dans les années 80), divers petits groupes de musiciens sont dispersés dans l'architecture du bâtiment, ils peuvent (ou non) se déplacer, voire se répondre les uns les autres, le public étant invité à les suivre à son gré. "En écrivant cette pièce, raconte le contrebassiste, je voulais permettre à la musique de remplir le bâtiment, de se déplacer à travers l'espace, afin de faire des transitions en expérimentant différentes ambiances musicales". Le public est alors convié à suivre un duo improvisé de violonistes -- la violoniste baroque Maya Homburger et le chef d'orchestre Christoph Poppen -- pour s'installer dans une autre salle et se préparer à apprécier After the Rain, par le Münchener Kammerorchester sous la direction de Christoph Poppen, avec son compositeur Barry Guy en invité très particulier à la seconde contrebasse. Ecrit pour orchestre de chambre, After the Rain est une commande du London Sinfonia datant de 1992. Forte et méditative, délicate et raffinée, la pièce possède une sensibilité baroque tout en étant traversée de traits contemporains vifs et acidulés. "After the Rain a été joué par différents orchestres de cordes, affirme Guy, mais je dois avouer que jusqu'ici c'est l'orchestre de chambre de Munich qui l'a le mieux joué, c'est extraordinaire d'obtenir un tel niveau d'expression." Nouveau déplacement dans une nouvelle salle pour la création de Switch par l'Ensemble ICI. Il s'agit d'une composition graphique assez sophistiquée en cinq mouvements où les musiciens sont invités par moments à prendre des décisions rapides. "La composition est centrée sur la relation entre le musicien et l'ensemble, ainsi que sur les interventions solistes qui ouvrent un dialogue d'investigation et de compréhension mutuelle". Une organisation vive et contrastée laissant découvrir des solistes de qualité, tels que le guitariste Gunnar Geisse ou le tubiste Tomas Zemek. Il reste à louer ici les efforts de Christoph Hoefig, au sein de l'office culturel de la ville de Munich, pour tenter d'ouvrir les portes de la capitale bavaroise (jusqu'ici lourdement dévolue à des formes artistiques très institutionnelles) aux musiques contemporaines créatives, écrites et improvisées. Barry Guy, qu'avez-vous ressenti à vous retrouver "simple contrebassiste" au sein de l'orchestre de chambre de Munich ? Comment conciliez-vous votre amour pour la musique baroque et pour la musique improvisée? Qu'en est-il du London Jazz Composers Orchestra, ce big band créé il y a une trentaine d'années et qui a neuf albums (notamment sur Intakt) à son actif ? L'orchestre se repose un peu, mais il existe encore. L'un de nos principaux problèmes est l'argent, les grands orchestres ne sont pas bon marché. J'aime payer mes gars correctement parce que les musiciens du LJCO n'ont fait que jouer leur musique toute leur vie, ils sont presque tous quinqua- ou sexagénaires et il n'est pas question de retourner en arrière. Si on regarde l'Italian Instabile Orchestra ou l'Orchestre National de Jazz français, on constate qu'ils reçoivent une aide très substantielle de l'Etat, et je trouve que c'est une bonne base. Nous n'avons jamais reçu ce type de subventions, je suppose que si je m'étais occupé du LJCO toute ma vie et si j'en étais devenu l'administrateur, j'aurais pu trouver de l'argent pour aider l'orchestre. Mais je suis un musicien et je ne peux pas passer mon temps assis derrière une machine à écrire à remplir des formulaires. D'une certaine façon, nous n'existons pas pour les institutions britanniques, la situation est très difficile. C'est la raison pour laquelle vous avez décidé de créer le Barry Guy New Orchestra ? Le trio avec Evan Parker et Paul Lytton existe-t-il encore ? Oui, mais Evan est très occupé partout, il est invité à participer à de nombreux ensembles différents et il ne pense pas nécessairement à trouver du travail pour le trio. Une tournée est prévue l'an prochain en Amérique sur la côte ouest, nous irons probablement au Japon cette année, et peut-être en Nouvelle-Zélande et en Australie. Quels sont les projets de Maya Records, le label animé par la violoniste baroque Maya Homburger et par vous-même ? Le label est resté en sommeil pendant deux ans et demi et nous allons recommencer la production. Je vais faire un album en solo, nous aurons aussi les Variations Goldberg de Bach avec le claveciniste irlandais Malcolm Proud, puis un trio avec Evan Parker, Laurence Casserley et moi avec de l'électronique et de la musique pour ordinateur, puis quelque chose en trio avec Mats Gustafsson et Raymond Strid. De plus, sur Intakt, un album en trio avec Marilyn Crispell et Paul Lytton va sortir incessamment avec mes compositions, ils vont aussi rééditer "Harmos" et "Double Trouble", tous les vieux favoris, puis Evan et moi ferons un album en duo pour Intakt. Si vous êtes arrivé directement sur cette page et ne voyez pas de barre de menu sur la gauche de l'écran, cliquez ici. Vous pourrez ainsi naviguer facilement dans tout le site. Reportage, photos et interview : © Gérard Rouy. Bassist/composer Barry Guy aligns a multinational band for this newly released CD featuring other modern jazz/improvising luminaries such as GuyÕs longtime musical partner, saxophonist Evan Parker, pianist Marilyn Crispell, trumpeter Herb Robertson, percussionist Paul Lytton and others. Basically, the music might elicit notions of one huge traffic jam amid moments of subtly stated interludes and the soloistsÕ quietly energetic exchanges. Overall, the bassistÕs new effort is a noteworthy entry into the ever expansive British Free/Euro jazz movement. Hence, Guy has always been a significant and altogether important player in these modern jazz and improvisational based genres. British virtuoso bassist and composer Guy continues to explore the ambiguous area between improvisation and composition, this time exchanging his London Jazz Composers Orchestra for an all-star tentet. In addition to being frequent collaborators in smaller bands, all of the participants have specialized abilities Guy puts to good use-such as Mats Gustafsson's percussive saxophone pointillism, Johannes Bauer's trombone brashness, drummers Paul Lytton's and Raymond Strid's crisp, unsystematic accents, and the rapid articulation of saxophonist Evan Parker and pianist Marilyn Crispell. Inscape-Tableaux, in seven sections, ranges from quiet and tranquil to jagged and volatile; passages of intense improv distill down to concentrated statements, with scored episodes offering respite and focus. As the instrumental combinations multiply and divide, there's a friction of unexpected voicings, and sparks fly. Though the reduced forces allow more flexibility and freedom, the music benefits from Guy's guidance. This music is wonderfully complicated. British bassist/composer Barry Guy has taken the ideas behind his London Jazz Composers Orchestra (LJCO) a considerable step further. The idea for the Barry Guy New Orchestra sprang from the logistics problems that he continuously encountered with the LJCO. For example, planning for the travel and accommodations for up to twenty other musicians is often a Sisyphean task. Funding is another issue altogether. Guy and Patrik Landolt of Intakt Records brainstormed, and when the dust had cleared, the idea for the Barry Guy New Orchestra was born: an international collective consisting of ten musicians. Funding is more dependable this way, from the international angle, at least for part of the group. The Swedish and Swiss governments are quite dedicated to the forward progress of their artists. Germany too, to some extent. The British Council lends a hand when it can to its musicians, as it has for many years with the LJCO. Then there are the Americans, but that is for another essay. Physically, it is also easier to move around ten musicians than it is eighteen. The only real remaining complication is ensuring that everyone's schedules jibe, which, under the circumstances, will often be hit or miss. With these intricacies ironed out, Guy could focus on composing for his new group. He imagined the unification of two of his working sax/bass/percussion trios to create a base for the new project. Because pianist Marilyn Crispell had experience with these trios, not to mention that she is such a dependable improviser, he chose to include her as a sort of common ground between the two units. The backbone of the music for "Inscape-Tableaux," the orchestra's maiden composition, fell easily (Guy admits) into place from this approach. Incidentally, healthy segments of the piece were written specifically for Crispell. Guy colored the composition further with equally demanding roles for the remainder of the group--trombone, trumpet, tuba, and more woodwinds. In a class by itself, the music that is "Inscape-Tableaux" bears the boldness of the LJCO, the consistent intelligence of its composer, and the complexity that is inherent in such a grouping. Guy conducts the orchestra, while playing contrabass simultaneously. Crispell is on piano, with Evan Parker and Mats Gustafsson on saxophones. The brass section is Herb Robertson on trumpet, Johannes Bauer on trombone, and Per �ke Holmlander in the tuba chair. Percussionists Paul Lytton and Raymond Strid complete the (ahem) "rhythm" instrumentation. And Swiss multi-instrumentalist Hans Koch plays soprano saxophone, bass clarinet, and contrabass clarinet. The 66-minute composition begins ("Part I") as if the orchestra has been hired for a Hitchcock film score, bright and fluttering. There is a break, and Bauer tears away with a brief trombone cadenza, which rises back into the collective. The orchestra wails again, breaks, and Robertson comes in with his own frantic lines, similar to those of the trombone. This pattern repeats itself several times, although not identically. There is a building of tension that comes with each successive break, between which different soloists make statements, sometimes in duos, larger in others. And so a barely detectable and complex pattern is revealed. "Part I" is a long, aggressive intro movement that does not cease until each musician has had his or her say, some of them bonding and some dramatically contrasting. Parker and Gustafsson have their own improvised section with the percussionists. Crispell and Parker mimic one another on piano and soprano saxophone, respectively. "Part I" momentarily becomes a handsome ballad, before returning to primary patterns, written structures interlaced with improv. "Part II" begins with Crispell following written material, and improvising in large areas. Parker joins her on soprano, in a similar flavor to their duet from "Part I." Their improvisations are textured by glissando entries and cut outs from the brass section. "Part III" and "Part IV" rival one another for the most aurally captivating "movement" of the piece. Almost entirely improvised, "Part III" consists heavily of wind and air sounds, and intermittent symphonic perturbations. These are achieved by discrete, seemingly random partnerships. "Part IV" is mostly a Crispell/Guy duo, both written and freely improvised and serves as an interim resolution amidst the controlled chaos of the rest of the piece. The piano and bass meet briefly to establish a theme before Guy launches, alone, into a free solo using a lightning pizzicato technique. He reconnects with Crispell, and the orchestra, restating the previously hinted theme. The remaining parts of "Inscape-Tableaux" are a commensurate extension of the first three. They are by no means alike in sound, but similar in energy and in the conductor's employment of individual musicians. It is fascinating to listen to the music in segments, or, to isolate contrasting trios of musicians playing against or in congruity with one another. The soloists are impeccable. Herb Robertson has a few show stopping moments in "Part VI." Koch's bass clarinet is a central figure in "Part VII." But Marilyn Crispell--largely due to much of the music being written around her--is the essence of "Inscape-Tableaux." Listeners can latch onto her from the get-go, clinging to the piano with one hand and inspecting the dark of the layered instrumentation with the other. So every good idea begins with a problem, although the music of Inscape-Tableaux leaves no indication otherwise. It is an astonishing accomplishment that should be experienced. è personaggio avvezzo alle avventure, alla sfida di assemblare suoni e personalità, Barry Guy: per quasi trent'anni ha diretto la London Jazz Composers Orchestra e ora snellisce l'organico e lo rende più internazionale per la sua New Orchestra, in cui trovano posto svedesi, tedeschi, svizzeri e americani, oltre ai vecchi compagni di avventura Evan Parker e Paul Lytton. Guy si ritrova quindi tra le mani un'orchestra più agile - e questo è un vantaggio anche dal punto di vista logistico e economico - ma non per questo di minore impatto rispetto alla sua "sorella maggiore": le personalità dei musicisti coinvolti garantiscono infatti al contrabbassista londinese una perfetta adesione alle parti scritte e una varietà improvvisativa a largo spettro. Se vogliamo curiosare dentro i meccanismi dell'orchestra scopriamo che alla base stanno due trii con cui Guy lavora da tempo: quello con Parker e Lytton e l'altro con Mats Gustafsson [per leggere la recensione del disco di Guy in duo con il sassofonista svedese, Frogging clicca qui] e Raymond Strid: già in passato a questi trii si era aggiunta Marilyn Crispell, che in questo disco svolge una precisa funzione di collante (oltre che di assoluto rilievo), specialmente nelle parti specificamente scritte per lei che fungono da interludio tra i momenti di maggiore compattezza orchestrale (si ascolti ad esempio la "Part IV", che si regge quasi esclusivamente sul duo tra piano e contrabbasso). Con queste solide fondamenta - paragone quanto mai appropriato quando si parla del musicista inglese, dato il suo interesse per l'architettura e la struttura profondamente architettonica della sua scrittura - Guy ha potuto felicemente lavorare sugli altri fiati, lasciando loro il terreno per scorribande di grande libertà (come nella Part V, con Johannes Bauer e Herb Robertson in evidenza tra free incendiario e modalità strumentali che tagliano obliquamente la storia della musica improvvisata). Tutta la suite è attraversata da accumuli sonori e zone di distensione che si alternano, a volte inquietanti, a tratti pensosi, a incominciare dalla lunga "Part I", in cui si inseguono brucianti collettivi e isole dialoganti, ma lungo l'intero svolgersi del disco si scoprono una scrittura e una concezione orchestrale in cui le singole parti si scompongono e ricompongono a seconda della funzionalità espressiva del momento, assecondando in maniera particolarmente felice le idee di Guy. Sicuramente disporre di musicisti che affrontano il proprio strumento in maniera così particolare, come Parker o Gustafsson, ma ottimi sono anche Hans Koch al clarinetto basso e la tuba di Per Ake Holmlander, dona all'insieme una notevole particolarità timbrica e Guy sfrutta appieno le possibilità di questa tavolozza, con il risultato che "Inscape-Tableaux" risulta un disco stimolante e riuscito, che consacra una volta ancora lo straordinario apporto che Marilyn Crispell sa portare (un po' com'era successo nel bellissimo After Appleby del trio Parker/Guy/Lytton) e che non deluderà gli appassionati delle avventure orchestrali più creative. Inscape-Tableaux is breathtaking - right off the bat. As the ten-piece orchestra spits up a screech, bustling, Per Ake Holmlander's tuba bumbles in, a lopsided lorry settling into a complex landscape. Bassist Barry Guy's New Orchestra is, simply, an extraordinary collection of european and American impovisers: Marilyn Crispell (piano); Evan Parker, Mats Gustafsson, Hans Koch (reeds), Johannes Bauer (trombone), Herb Robertson (trompet), Holmlander (tuba), Paul Lytton and Raymond Strid (percussion). Guy, Lytton, and Parker's recent work with Crispell is always close to the surface: the 'tableaux' - a suite of seven multi-layered pieces clustered with frightening discord and stark, irreducible beauty - builds up around them. Indeed, Crispell is in excetpional form. Frequently presented with open spaces, she unleashes labyrinths or tears pockets of space into chasms. Even when she runs below the ensemble, Crispell can set you into revierie or run you flat up against a wall.